I was in China when it happened. In the hours I struggled to get back home from halfway around the world, I remember wondering how I would comfort my boys. I was barely in control of myself, and I couldn’t imagine trying to explain to my young sons that their PaPa was gone. When I finally got to Missouri, my family and friends held me up. My wife stayed at my side through the exhausting and terrible logistical protocols of death. Through it all, my friend Ruth watched over my sons. I’d known her for a quarter century. She married the man with whom I’d spent almost every day from kindergarten to high school graduation. She was a saint. Over the past 12 months, I’ve dreaded this weekend in ways I can’t really explain. Part of me wanted to go to bed the night before Thanksgiving and wake up tomorrow. That feeling grew stronger as I made it through the weekend. But when I woke up yesterday, I got news that broke my heart. Ruth’s dad had died Sunday morning, almost exactly a year from the day my dad died. I spent most of Sunday thinking about Ruth, wishing I could be there for her as she was for me a year ago. Last night, I crawled into bed early, exhausted and emotionally shot. I grabbed a t-shirt from a bedside drawer, one that I hadn’t worn in seven years. On the front of it was my face and the face of three other dear friends with whom I worked at the TV station years ago. The four of us worked in a little area just off the main newsroom. We called it The Romper Room, and we spent years there like brothers and sisters. One of the four of us in that room was my buddy Nigel, a guy who has reached out countless times over the past year to make sure I was okay, a guy who had checked in just this weekend because he knew it was going to be tough on me. Eight miles later, we climbed back in the car and got ready to go pick up the kids from school. We grabbed our phones and read the message at the same time. Nigel’s dad died this morning, exactly a year to the day after my dad. Over the past year, I’ve been forced to learn a lot about grief and what it really means. One of the things that’s struck me the most is how intensely personal such a universal experience can feel. Almost everybody loses their dad at some point. It’s a pain we’ll all have to know, and it’s seems like it’s something we could all share as a bond. That’s not really the case, though. Though countless other people have experienced the loss, each one is different and personal. Even today as I think about my dad and the first year I’ve spent without him, I can’t find adequate words for my friends who are missing their fathers for the first time. This is my best attempt. I wish you both peace. It’s not necessarily easy to find, but it’s out there. It’s in the eyes of your children and the love of your spouses. It’s in waking up to pretty skies and knowing that you have made it this far because of how much your dads loved you. It’s in the life you still have with the rest of your family, people your fathers loved as much as you do. It’s in knowing that your daily smiles and continued drive toward happiness are what your dads would’ve wished for you. It’s in knowing your dads sacrificed for you so your life with your children would be easier. It’s in knowing that the grief you feel is yours, and that you will use it to be better, not worse. It’s in knowing that you can’t change what’s happened, but your can continue to live in a way that would make your dads proud. It’s in a love that prevails over grief. Both of my kids are home from school now. One has a lot of homework. The other one is proud of the boo-boos he got on the playground. They are both as happy as I could want. I know it’s my job to make sure they stay that way. The best way to make sure it happens is to keep hold of that sometimes elusive peace. I won’t stop wishing my dad was here to help me teach them, but I know this: a father’s true legacy is not in the money he makes for his kids. It’s not for the things he buys them, the power they achieve, or their success in business. The true legacy of a father is how happy his children are, and in turn how happy they can make their kids. By that measure, my dad was a successful as any man I know. Peace to my friends tonight. I’m sorry your dads are gone, but I smile knowing their legacies are so strong. Much peace to you today Brad. It goes without saying that your eloquence is part of the reason I’ll be where I’m going next weekend instead of Vegas. Sending hugs your way today, Brad. Having had the privilege of calling two of the three dad’s you wrote about “Dad” myself (legally or in spirit) I could not agree more. 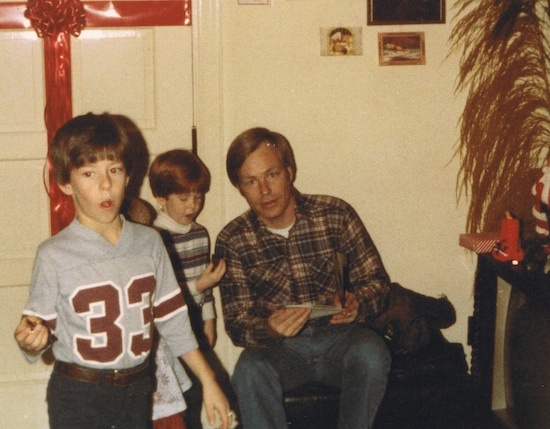 I was thinking about John this morning myself and reflecting on the “Dad” lessons that both he and Bill taught me. Their legacy will live on forever in big ways and small in how you, Jeff, me and many others are raising our kids. The new generation of Willis kids are truly lucky to have great Dads like you and Jeff! Beautifully written, much needed words. My father passed away about this time last year, too, and I dreaded the anniversary. At least four other friends lost their fathers this past year, and another just a couple of weeks ago. I guess you see more of this as you age.